If your project is failing, how do you know whether to end it or push on? Jennifer Bridges, PMP, helps you make the right decision. When determining whether a project is worth continuing or if it’s a lost cause, Jennifer said project managers need to focus on losses. Only then can you make the right decision when managing your project. People will often continue projects based on false premises, such as the idea that if you throw money at a problem, it’ll get fixed. This is called the sunk cost fallacy. It’s another way of saying, throwing good money after bad. There’s a point at which no matter how much you invest, recovery is impossible. Another pot hole to avoid is something called the commitment fallacy. This is when people are so committed to a project that they refuse to admit defeat to the point of catastrophic damage to their project, reputation and company. The truth is that projects don’t always follow the trajectory you planned for. Situations and conditions change. Jennifer offered a list of forces that can alter the course of a project. Any one or more of these changes will impact the project. They will be felt in the project scope or the cost and time involved. They might influence the quality of the project. A project can bounce back from some of these changes and not from others. But how can one know? Jennifer offered some advice as to how to tell that a project is no longer worth pursuing. It’s a hard choice, but it’s better to pull the Band-Aid off quickly then prolong the pain. When it no longer meets the project needs, such as the original purpose of the project has changed and can’t be met. The costs are out of control, and there is no way to recoup the return on investment. The cost to complete exceeds the budget, and it is impossible to cover the difference in costs. The circumstances affect the possibility of completion, such as those listed above. There are ethical and/or legal issues. Pro-Tip: Of course, these aren’t the only reasons why projects fail. There can be conflicts within the team that can’t be resolved or disagreements on how to move forward that can stymie progress. 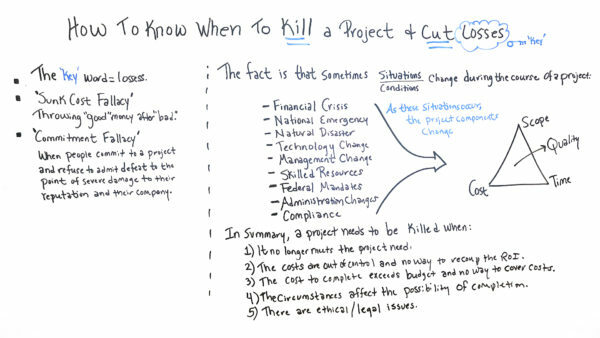 Today, we’re talking about how to know when to kill a project and cut losses. Well, with the number of trouble projects and failed projects, this is a really hot topic. But I submit that the key word here is the losses. When you start taking a loss in your project, you really need to consider the truth of, do I need to kill this thing? There are a couple of fallacies that happen on projects that I wanna bring attention to. Number one is the “sunk cost fallacy” where it’s really throwing good money after bad. At a certain level, there are so many sunk costs that you can’t recover, but for some reason, some people think the more money you throw at it, the better it’s gonna get. But it never gets better, they’re a sunk cost. There’s also the “commitment fallacy” where when people commit to a project and they refuse to admit defeat, and so what happens is, it’s to the point of severe damage to not only their personal reputation, but also of that of their company. So we wanna look at the fact that sometimes there are situations, there are conditions that change during the course of a project that we wanna look at, because some projects can be short in duration, but some can go…they can span multiple years. So during the course of a project, what might happen is a financial crisis may occur. So no matter what area of the globe that you’re in, we’ve all seen this. Also there are occasions where national emergencies occur, or even natural disasters. There are also during the course of time a major technology may change impacting the thing. Also there could be management changes, key management who were supporting maybe being a stakeholder, or key person on the team, if they change that can also change the success of the project. Also, there could be skilled resources. Sometimes during the course of a project, again, if technology changes or if it’s something new, having access to the skilled resources who know how to pull that off, may be limited. Also, there are times when federal mandates occur during a project. Almost every industry has some form of governmental guidelines and compliance they have to comply with and sometimes these mandates really impact that those projects. Also administration changes. No matter what country you live in, there are times when the leaders of the country change and with that they change out their administration, the people who support them. That also can change the dynamics of certain projects. And also compliance. If there are regulations that come down that the project can’t meet, it also needs to be looked at to be killed. So when these situations occur, these project components also change. When these change they typically impact the scope of the project, sometimes the cost, the time, or the schedule, and then even the quality of the project. And when they do, in summary, a project needs to be killed when number one, it no longer meets the project need. So the original purpose of that project changes and if this project can no longer meet it, it needs to be killed. If the costs are out of control and there’s no way to recoup the ROI, again, many times with trouble projects or failed projects, this is one of the reasons. Also, the cost to complete exceeds the budget and there’s no way to cover those costs. Again, due to the nature of some projects spanning so long and the costs change, there are some times where a reevaluation has to occur to determine, okay, we haven’t met the timeline or the schedule to complete the project. So now at this point, how long is it going to take? So, if the amount of time and the amount of cost exceed what the stakeholders of that project can pay for, it has to be shut down. Also, the circumstances affect the possibility. Again, these circumstances if they impact the possibility of completion. If some of these things are happening, there are times, think about it, if it’s a construction project and you’ve had a natural disaster, it could be in an area where there’s no possible way for it to be completed. If a major technology change occurs that impacts the whole project, it may not have the possibility of being completed. So these are things that need to be looked at and considered. And if there are ethical and legal issues I would submit that project needs to be killed. So, these are some things to think about in making that hard decision to kill the project and not be caught up in the commitment fallacy. So if you need a tool that can help you with your project, then sign up for our software now at ProjectManager.com.